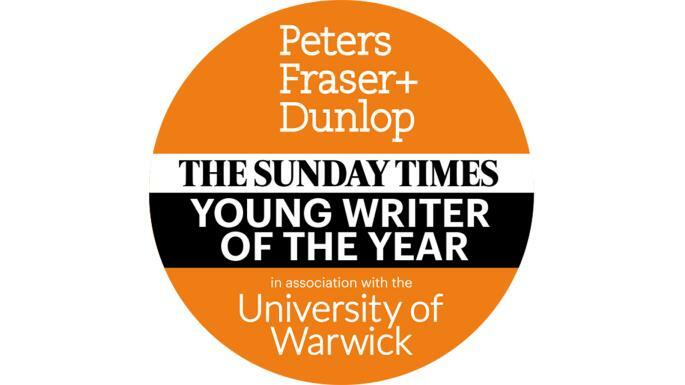 Submissions are now open for The Sunday Times / Peters Fraser + Dunlop Young Writer of the Year Award 2018 in association with the University of Warwick. The prize, which identifies and champions the best writers of fiction, non-fiction and poetry aged 18-35, has become the definitive platform for young writing in Britain and Ireland – working with a growing network of partners to provide a vital support system to the very best talent at work right now. The Irish writer Sally Rooney was named last year’s Young Writer of the Year for Conversation with Friends (Faber & Faber): her novel is currently shortlisted for the £20,000 Rathbones Folio Prize; the Swansea University International Dylan Thomas Prize; and the British Book Awards (Book of the Year - Fiction: Debut). Rooney followed Max Porter with Grief is the Thing with Feathers (Faber & Faber), whose second novel, Lanny, has just been announced by Faber & Faber, and the poet Sarah Howe, who was awarded in 2015 for her first collection, Loop of Jade (Chatto & Windus), which went on to win the T.S. Eliot Prize. Generously sponsored by literary agency Peters Fraser + Dunlop, the Young Writer of the Year Award is running in association with the University of Warwick – home to the acclaimed Warwick Writing Programme – who are offering a bespoke 10-week residency for the award’s winner, and a year long programme of digital support for the Prize. The British Council is the international partner of the prize. Submissions close on Friday, 8 June, 2018. To be eligible books must have been first published in the UK and/or the Republic of Ireland, in the English language, between 3 June 2017 and 8 June 2018. The author must be aged 18-35. The award is open to both traditionally and self-published work. The 2018 judging panel will be revealed in the coming weeks, with the shortlist of four books announced on 4 November, followed by the winner on 6 December. £5,000 is given to the overall winner and £500 to each of the three runners-up. Past winners include: Ross Raisin, God’s Own Country (2009); Adam Foulds, The Truth About These Strange Times (2008); Naomi Alderman, Disobedience (2007), Robert Macfarlane, Mountains of the Mind: a History of a Fascination (2004); William Fiennes, The Snow Geese (2003); Zadie Smith, White Teeth (2001); Sarah Waters, Affinity (2000); Paul Farley, The Boy from the Chemist is Here to See You (1999); Patrick French, Liberty or Death: India’s Journey to Independence and Division (1998); Francis Spufford, I May Be Some Time: Ice and the English Imagination (1997); Katherine Pierpoint, Truffle Beds (1996); Andrew Cowan, Pig (1995); William Dalrymple, City of Djinns: A Year in Delhi (1994); Simon Armitage, Kid (1993); Caryl Phillips, Cambridge (1992); and Helen Simpson, Four Bare Legs in a Bed and Other Stories (1991). Founded in 1991, the award recognises the best literary work of fiction, non-fiction or poetry by a British or Irish writer of 35 and under. £5,000 is given to the winner, and £500 to each of the three runners-up. The award was suspended in 2008, but with the generous sponsorship of Peters Fraser + Dunlop it was revitalised in 2015, building on the remarkable legacy of the prize by introducing two significant and exciting innovations: extending its reach by including writers from Ireland and including self-published works as well as those from publishers – putting the prize in tune with the changing landscape of British publishing. In 2017 the prize secured two further partnerships with the University of Warwick and the British Council. Peters Fraser + Dunlop is one of the oldest and most established literary and talent agencies in London. We are proud to represent authors, journalists, broadcasters, speakers and estates with specialist expertise in the fields of literature, film, television and radio, public speaking, digital platforms and journalism. We offer our clients the best people to work with and the expertise to develop long-term value in their work across all media while protecting their rights in today’s changing market. Our business is about creativity, enhancement, innovation and service. The University of Warwick offers a bespoke 10-week winner residency, a festival of events, and a year round programme of digital support for the Prize. The University of Warwick is consistently ranked in the top 10 universities in the UK and top 100 in the world, with the Warwick Writing Programme ranked No1 in the UK by The Sunday Times Good University Guide 2018. It is one of the UK’s leading universities, with an acknowledged reputation for excellence in research, teaching and innovation alongside pioneering links with business and industry. It is home to the acclaimed Warwick Writing Programme, the largest and most comprehensive of its kind in Europe, which is currently home to renowned authors such as: Will Eaves, Maureen Freely, Michael Hulse, A.L. Kennedy, Tim Leach, David Morley, Sarah Moss, Ian Sansom, Jonathan Skinner, and David Vann. The Society of Authors is the UK trade union for all types of writers, illustrators and literary translators, at all stages of their careers. They have more than 10,000 members and have been advising individuals and speaking out for the profession for more than a century. In 2017, they will award more than £400,000 in prizes and grants (for fiction, non-fiction, poetry and translation), and also administer the Sunday Times / Peters, Fraser & Dunlop Young Writer of the Year Award, along with the Women’s Prize for Fiction and The Sunday Times EFG Short Story Award.